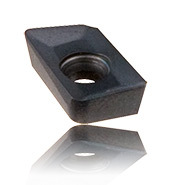 • Submicron carbide inserts are fully ground for high precision output. 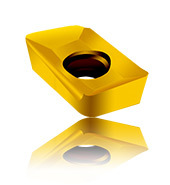 • Strong insert with high positive geometry and helical cutting edges. • Shoulder mill with good cutting performance and cutting edge strength. High rigidity, special edge honing, resistance of impact during milling operation, good for milling of carbon steel and alloy steel. • K20F grade, AlTiN coated. • Special chip breaker design. • Good for hard cutting carbon steel and alloy steel. • P40 tougher grade for smooth cutting, AlCrN coated. • Good for all kinds of steel. Sharp cutting edge and high positive rake angle, good for finishing milling and surface roughness. • For better surface roughness. Sharp cutting edge and high positive rake angle, low friction coefficient for Non-Ferrous metal. 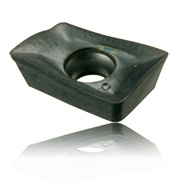 • Good for Al, Al-alloy, Copper, Copper alloy and Non-Ferrous metal, etc.